Are you fed up with your bank? Do you think that bank fees are too high? Does your bank lack the ability to know you? YES! Well, sorry Traditional Banks. 99% of account holders are more likely to say yes. Switching checking/current accounts takes as little as 7 days. As an account holder, I would rather switch my account to a so-called challenger bank, where I feel my needs are better met. Bank regulators have relaxed rules for new entrants to make it easier for firms to become banks. The Financial Conduct Authority (FCA) and the Prudential Regulation Authority (PRA) in the UK have over 25+ applications pending from firms that have applied for authorization to become banks and a few challenger banks won their licenses in 2015. However, big banks are somewhat keen to influence policy making in the UK. Additional corporate tax surcharges are indeed jeopardizing the growth of challenger banks. In a bid to further improve competition in banking and to show support for UK challenger banks, the Treasury will meet with the challenger banks at least four times a year through the Challenger Bank High Level Advisory Group. So before you can start applying for a banking licence, there are basics that should get you to that point. I decided to pose the following question to a pre-licence challenger bank: What are the five basics you need to start a challenger bank? About Secco: Secco is an early-stage, pre-licence challenger bank based in London with a vision to re-invent banking. 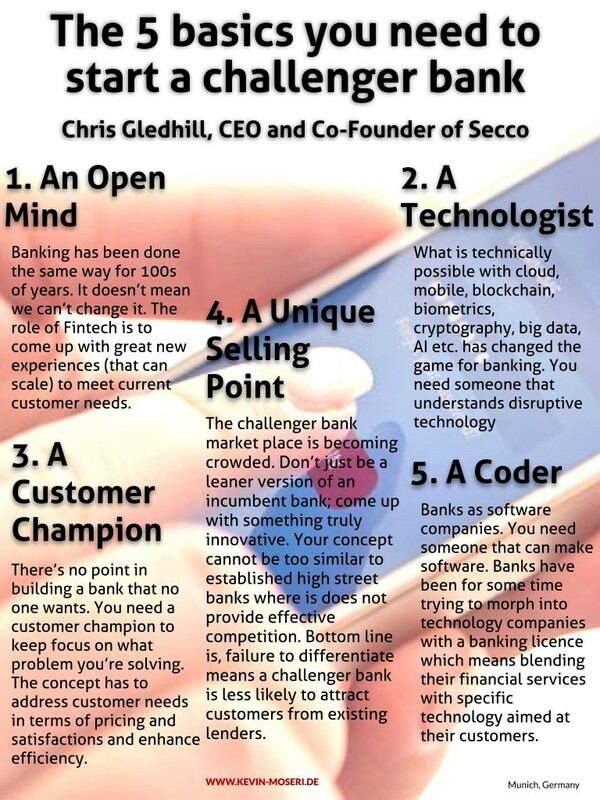 Secco aims to take banking back to first principles but with a 21stcentury execution – A bank for NOW. So what do you think the impact of challenger banks will be on the banking experience? Post your thoughts on the comments section below.